HTM associate Donovan Williams discusses a Jenga-playing robot with Ohio Hi-Point Career Center students touring the plant, kicking off National Manufacturing Day activities planned by Honda. Williams and other associates along the tour stressed the need for skilled workers who can program and repair the multitude of high-tech machines throughout the plant. Students from a score of other area high schools were scheduled to tour the plant over the next several business days. RUSSELLS POINT – Scot McLemore is a man on a mission. He wants to change perceptions of how society views the manufacturing business in general and, specifically, how factories and those who work in them are viewed. McLemore made these statements shortly after a group of students from the Ohio Hi-Point Career Center got a tour of the Honda Transmission Manufacturing facility just south of Russells Point on Oct. 2. This is part of a program that Honda initiated this year on National Manufacturing Day to reach out to local students – most of whom have only seen factories from the highway – and give them a glimpse of what goes on inside. Over the next several business days, students from Anna, Bellefontaine, Benjamin Logan, Botkins, Fairlawn, Indian Lake, Jackson Center, Kenton, Ridgemont, Riverside, Sidney, Triad, Upper Scioto Valley, Wapakoneta and Waynesfield-Goshen were scheduled to take the tour. McLemore and Honda hope to see these same students back in the near future as highly-skilled technicians programming and repairing the robotics and other high-tech mechanics that are part of today’s heavy industry. The 1.1 million square-foot HTM facility goes a long way to proving McLemore’s point. It’s well-lit, open, airy, free of rubbish and other detritus. HTM is in the business of casting, machining and assembling transmissions for automobiles, so it is packed full of machinery ranging from impact wrenches to a machine the size of a pole barn that heats and cuts aluminum rods to spec for the various gears produced at HTM. Much of what lies between these two extremes are technologies – robotics, pneumatics, programming, industrial design and a host of others – that are innovating at light speed and can be found throughout the HTM campus. McLemore and Honda are looking to local high schools for their future workers who can implement or even invent these new technologies and apply them at HTM or other Honda plants. To that end, Honda invited representatives from all the area career centers and communities colleges to be part of the tour. Each of the schools set up a display in the state-of-the-art recreation and health center at HTM, showing the students a direct path from high school student to a highly-employable citizen with critical technological expertise. 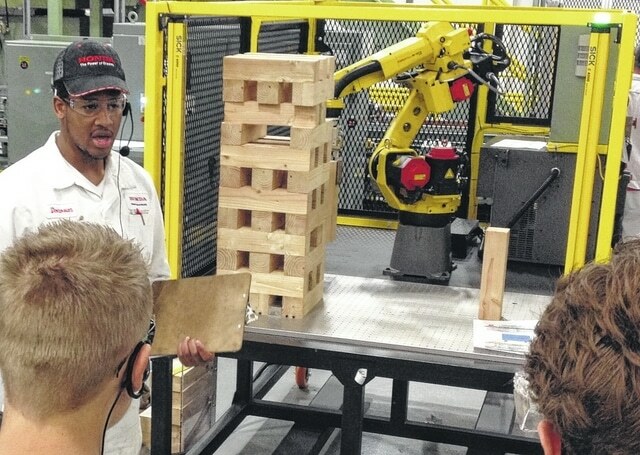 https://www.urbanacitizen.com/wp-content/uploads/sites/36/2015/10/web1_IMG_6209.jpgHTM associate Donovan Williams discusses a Jenga-playing robot with Ohio Hi-Point Career Center students touring the plant, kicking off National Manufacturing Day activities planned by Honda. Williams and other associates along the tour stressed the need for skilled workers who can program and repair the multitude of high-tech machines throughout the plant. Students from a score of other area high schools were scheduled to tour the plant over the next several business days.